Northern Arizona is best known for the Grand Canyon. Less widely known are the hundreds of geologically young volcanoes scattered across the southern portion of the Colorado Plateau at the eastern foothills of the San Francisco Peaks. This image from the Advanced Spaceborne Thermal Emission and Reflection Radiometer (ASTER) on NASA’s Terra satellite shows the numerous cinder cones, hills of volcanic ash and rock fragments, in the San Francisco Volcanic Field in the foreground (bottom part of the scene) with San Francisco Mountain in the background. ASTER image data from October 21, 2003, were draped over topographic data from the U.S. Geological Survey. The picture is oriented as if you were looking generally westward. The large version of the image is centered near 35.3 degrees north latitude and 111.5 degrees west longitude. The developed areas of the outskirts of Flagstaff, Arizona, appear as bright white flecks against the surrounding vegetation. To the north of the city rises Elden Mountain, separated by a canyon from the larger San Francisco Mountain. 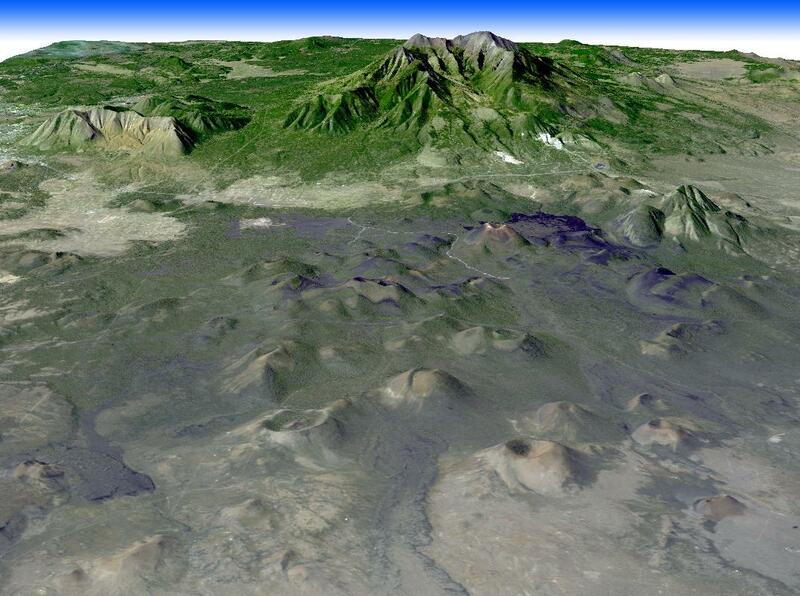 The catastrophic result of an eruption at San Francisco Mountain about 400,000 years ago is visible in the collapsed look of the mountain’s eastern flank. 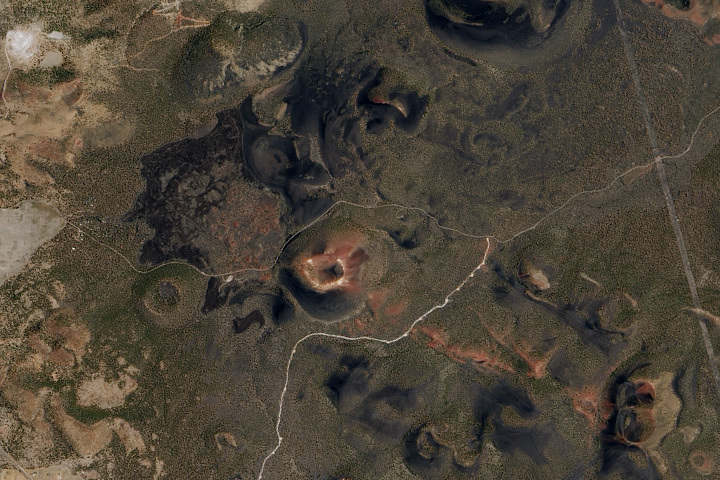 Lava and other volcanic material appear purple, and the cinder cone field is tinged with green, as vegetation begins to colonize the newly laid landscape. 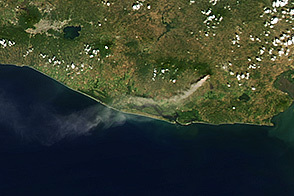 Among the most dramatic flows is the Bonito Lava Flow. Native Americans were living in this region when the cinder cone volcano known as Sunset Crater (named for the red-tinged rocks and cinders on its slopes) was born around 900 years ago. Accounts of the volcanic activity, which included several eruptions between A.D. 1064 and 1180, describe earthquakes, fire bombs, billowing ash, falling cinders, forest fires, and lava flows. The region is part of the sacred lands of several modern Pueblo peoples, and Sunset Crater is protected as a National Monument. Northern Arizona is best known for the Grand Canyon. 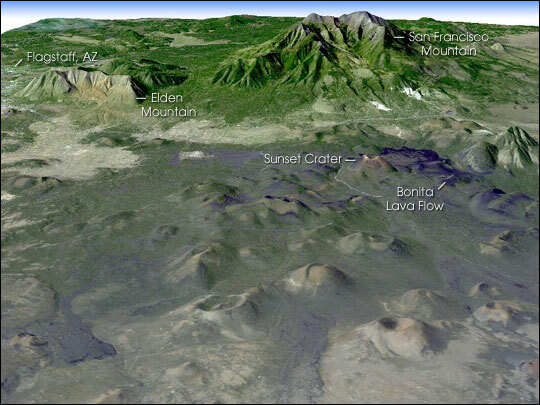 Less widely known are the hundreds of geologically young volcanoes scattered across the southern portion of the Colorado Plateau at the eastern foothills of the San Francisco Peaks.